The Support & Helpdesk market has grown as a result of the universality of communication via social media and mobile devices. Customers expect to be able to contact businesses through an array of different channels, such as email, social media, and phone. As such, Support & Helpdesk software has become essential for customer-facing businesses. Recent trends have seen Support & Helpdesk vendors offer more avenues for self-service. Knowledge base capabilities, online communities, and FAQ’s have become more common in software products. This is a natural evolution of a market that is characterized by quick resolution times. There is generally less product differentiation in the Support &Helpdesk market, with vendors seeking to stand out by offering more advanced features, such as social media integration, gamification and increased security protection for larger businesses. The market has seen some disruption with vendors offering free options for their services in an industry that was largely characterized by paid pricing plans. The Crozdesk Market Radar™ reveals a market with many big names that offer helpdesk suites, such as Freshdesk and Zendesk, each of them holding onto a significant chunk of market share. Despite this, the industry remains competitive with a high number of startup companies looking to break into the market. Customers encounter problems all the time, and more often than not, these problems will arise at the most inopportune moments. Keeping track of these issues and resolving them quickly can prove to be difficult and time-consuming if you are doing it the old-fashioned way, through manual tracking on spreadsheets and searching through flooded email inboxes. With a Support & Helpdesk software, you can track and resolve issues efficiently with a wide-range of solutions like ticket management, live chat, reporting, and analytics. 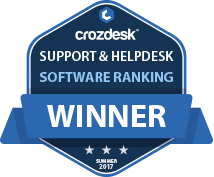 The following list reveals the top Support & Helpdesk software which have been ranked by the Crozscore algorithm. This ranking was published on October 30, 2017. 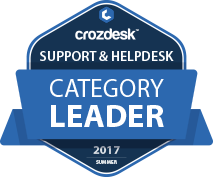 For the most up-to-date Crozscores, user reviews and other information please have a look at the full list of Support & Helpdesk Solutions. All scores are fixed as of the date of publication. What is Support & Helpdesk Software? Support & Helpdesk software helps manage, monitor and respond to customer queries and service requests in an organized way. Products in this category usually have an automated ticket management system and a knowledge base that lets users find answers to certain queries and resolve certain problems themselves, without having to contact the helpdesk. The ticket management system enables customer service representatives to generate support tickets, set priorities, track ticket status, close a ticket and mark it as resolved. If required, they can even re-open a ticket or escalate the issue to a specialist. On the other hand, the knowledge base is a repository of guide articles, FAQs, descriptions of previously resolved problems, often made available through a self-service portal. Most knowledge bases come with advanced search and autosuggest features. More advanced products feature analytics and reporting capability, multi-channel support, mobile support and remote control capability. What Support & Helpdesk Software Should I Choose? Some vital considerations when choosing Support & Helpdesk software include the size of your business, whether you’ll be using the software to serve external customers or internal teams, whether your business follows the Information Technology Infrastructure Library (ITIL) guidelines and any other particular needs. Some products are specifically designed for SMBs, while others are more suitable for large corporations. For instance, if you have a large customer base, you may need a Support & Helpdesk solution that allows your customers to raise tickets directly from their social media accounts. For small businesses, a basic ticketing system that allows for ticket creation via a web form, phone or email may suffice. You may also want to consider whether the system allows your agents to edit and organize tickets based on priority and whether it has an automated issue escalation process. Large organizations often look for a product that allows them to create separate sections within the knowledge base. If your business follows ITIL guidelines for better change management or incident management, you need a solution built around ITIL framework. If you are more concerned about data security, consider looking for a solution that offers identity management features, such as, single sign-on. It all depends on your requirements and priorities. Another thing to consider is whether the software has advanced analytics and reporting tools. Some products allow you to monitor and analyze performance based on metrics, such as ticket resolution time and customer feedback. Other important considerations include ease of use and integration capability. Call Tracking Track which of your online and offline marketing efforts are successfully generating calls. Time Management Monitor and optimize how you're spending your time.